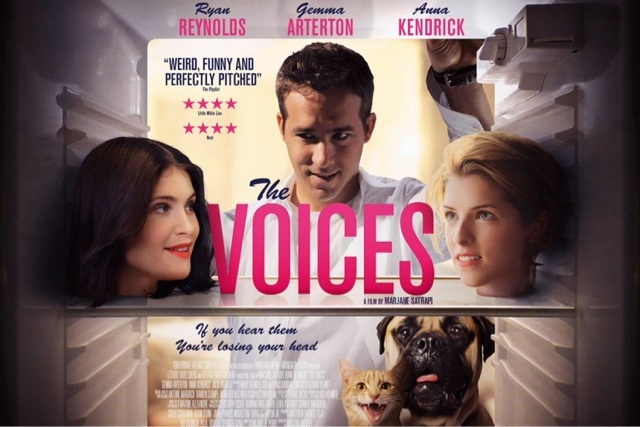 While surfing through the channels the other night, looking for something to watch, I came across this movie, The Voices. I remember hearing people talk about it, saying that it was a good film, but I just never got around to watching it. The only thing I knew about it was that it starred Ryan Reynolds. Then I read the description. The Voices is about Jerry, a mentally unhinged factory worker who, with the help of his court-appointed psychiatrist, finally decides to pursue his office crush. But after being stood up, he takes a sudden, murderous turn. Jerry must then decide whether he should listen to his evil talking cat and murder again, or listen to his talking dog and turn himself in. This dark, horror-comedy directed by Marjane Satrapi (Persepolis) and written by Michael R. Perry (Paranormal Activity 2) really surprised me. It went in a direction that I definitely didn't expect and turned into a very entertaining film. Ryan Reynolds was great in his role as the schizophrenic Jerry. He brought a wonderful humor to this dark comedy, and truly makes me believe that his portrayal of Deadpool will be spot on. We also saw great performances from Gemma Arterton and Anna Kendrick. The Voices is a film that showcases dark comedy in a great way, never getting so dark that you forget about the humor within. I really enjoyed everything about this film, up until the very end. The film concludes with a song-and-dance number that felt a little out of place to me, but other than that, it was a great film and I would highly recommend it.